The PlayStation 3 manufacturer has called on developers to add 3D only where it makes a difference to gameplay, and not for the sake of it. "It's been a good first year," Sony's 3D chief Mick Hocking told Eurogamer in an interview at the Develop conference in Brighton this afternoon. "We've got 50 million PlayStation 3s that support 3D playback. 3DTVs are selling well. We've had great response from our fans out there at game shows and forums about the 3D games we've produced. But the most important thing is 3D quality. "We need to, and we're trying to encourage everyone to learn about 3D properly and come and talk to us so we'll support them when they convert the games. "But only deliver the best quality 3D. As we've seen in some other industries, if you make great quality 3D, in film you could say Avatar – it's the most successful film of all time, it's the highest grossing film of all time – but since then that hasn't been followed up with the same degree of success. "We've spent a lot of time getting great quality across all the PS3 games, and we've had a very good response for that, but it's really important we maintain that level of quality. "If people see great quality 3D it does enhance the experience. It's a great feature for a game. But if they see poor quality 3D it can put them off. "Unfortunately some people are producing poor quality 3D, in all mediums. Over the last 12 months we've seen TV, film, some games, where the quality hasn't been there. It's just a case of people need to understand how to work with 3D, how to make it technically correct and then how to use it creatively. "Only add 3D where it makes a difference to the gameplay experience. It must add something. Don't just add depth for the sake of it." Sony has over the last 12 months pushed 3D gaming hard, with PlayStation 3 exclusives Killzone 3, Gran Turismo 5 and MotorStorm: Apocalypse all supporting the feature. Many publishers remain cautious, however. Hocking said it's important third-party developers make sure their 3D is up to scratch because gamers want to know they're getting value out of their expensive 3DTVs. "We've tried not to have this big spike in quality. We want everyone to develop 3D really well, because when you invest in a 3DTV you want to know there's a library of great stuff out there on PS3 to go and buy, not one title that does it all and then some others that are OK. Looking to the future, Hocking said Sony has a "really strong range" of 3D titles coming out and "lots more in production". "All of our teams are doing great stuff. 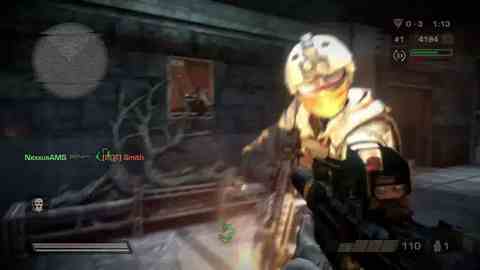 Killzone 3 was an excellent example of 3D. MotorStorm: Apocalypse was fantastic 3D. Ratchet & Clank: All 4 One, that's their first 3D game and it looks superb." One 3D-enabled, upcoming PS3 exclusive that fans are looking forward to is Naughty Dog's Uncharted 3, which Hocking is particularly excited about. "We're onto the second generation of games and we've got things like Uncharted 3. They tend to do everything pretty well, and surprise surprise, they've done 3D really nicely as well. It looks beautiful."